Ok, not quite. But I narrowly avoided one. 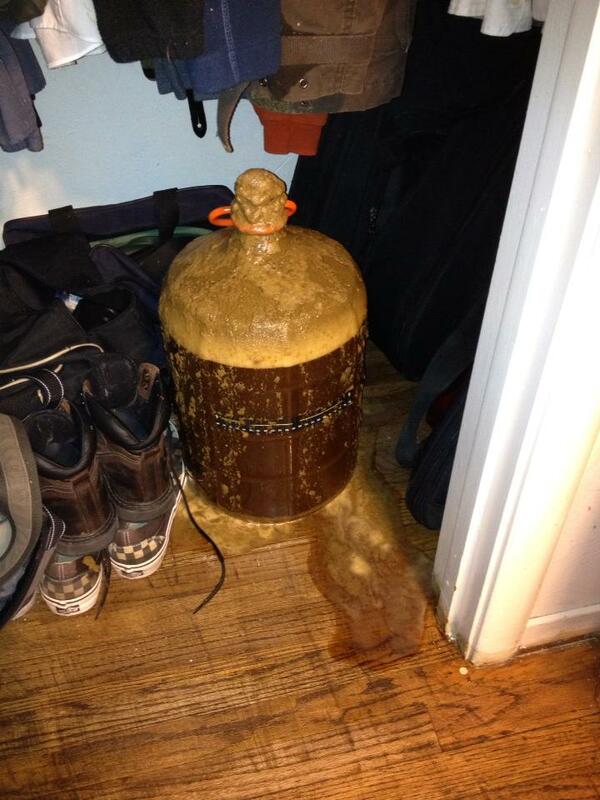 Some of you may remember an incident which took place with one of my very first batches of homebrew, the “IPA Gone Wild”. The crafty yeast threw me off with one day of showing no activity, then faked right, threw an elbow, and sunk a layup as I sprawled across the blacktop. I awoke the second morning to find my airlock clogged and launched, my clothes covered in grain bits, and my shoes and guitars soaked in an overflow brewpuddle. That is one of the saddest words on earth. Brewpuddle. Anyway, I transferred the batch to a larger fermenter, sopped up my own puddle of tears over the wasted beer, and the rest of the process went swimmingly. Since then I’ve done things a bit differently, mostly using a 7gal container for the primary to leave room for any rogue frenzies. However, this is the first time I’ve had two batches fermenting simultaneously, so I had to use a carboy for the second batch. Since it’s a relatively simple recipe, a Bavarian Hefeweizen, I just made the batch a tad smaller and planned to add more water later, probably just before kegging. I checked on it just 12 hrs after boiling and it had already foamed up into the airlock and was spitting everywhere. Luckily I caught it before it blew the top off and really made a mess. I wrapped the carboy in towels to save the floor from drips, cleaned the airlock, cleared some foam, and set it up again. By that evening it had calmed down a bit, but That brew is still churning away under the surface. That’s what I love about a glass carboy. It’s just plain cool to see bubbles and grain swirling in a yeast induced frenzy! P.S: I played around with the recipe a bit, adding freshly sliced orange, a splash of cinnamon and a few cloves into the boil during the last ten minutes or so. I likely taste it at keg time, and may drop a stick or two of cinnamon in the keg so the spicy taste grows as it ages. As I heard my brother’s voice on the other end of the line, it struck me how perfect the idea was. 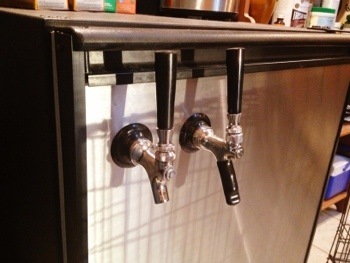 Everyone was encouraged to make or bring something, and creating a keg of unique custom suds seemed like just the kind of unexpected and generous thing we Matzes are fond of. I immediately jumped on the opportunity and we started brainstorming. The plan ended up to be to use a Lagunitas style IPA as a base and add a bit of herby goodness. The trick would be to add the right amount, just enough to be interesting without becoming like a mouthfull of weird bubbly medicine. We followed a recipe I’ve used many times, but thinned it out a bit with extra water and added a fresh branch of Rosemary cut straight from the giant mutant bush in my backyard in the last five minutes of the boil and during the cooldown. Later I pitched the yeast and capped it, setting it in the cool shade of my closet to bubble away. Throughout the next two weeks I enjoyed the aroma of the yeast’s work every time I opened the door. Those little organisms feasting on an abundance of malt extract created their signature scent, which I only hope doesn’t stick to my clothing too much! When it was time to keg, it was anyone’s guess what it would taste like. I siphoned and strained the golden nectar into a 5gal keg and cooled it for a couple days before tasting. I poured a bit from the tap and tasted. BINGO! JUST RIGHT! Granted it was quite a strong beer, probably around 9% and with an herby, hoppy punch, but everyone at the party seemed to like it and I heard quite a few say they preferred it to the Racer 5 IPA which was also there. A statement like that will make a brewer’s heart proud! In fact, I went back to retrieve the keg the next day and it was bone dry. The experiment had worked out and my head is swimming with possibilities for the next infusion to try. I recently made a big batch of stout, basically a clone of Old Rasputin but with a couple habaneros thrown into the boil. The only trouble is that it turned out too heavy for the wife. So I thoughtfully went out of my way to brew a second batch of Lagunitas-style IPA to ensure that everyone had something carbonated to bring a smile to their face. It was rough, I’m such a good guy. Totally didn’t enjoy it at all. 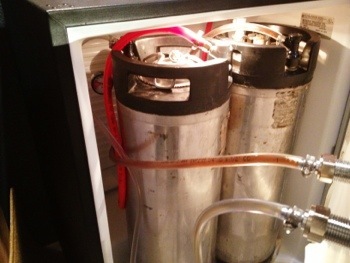 Two batches means two kegs! Please welcome the newest addition to our homestead! Tap número dos!! !